Portimão, 5 June 2015 – The first two free practice sessions on the Portuguese weekend had both the Aprilia RSV4 RF bikes in the top ten. For the Aprilia Racing Red Devils riders this is the first step that needs to be improved in the decisive rounds Saturday. Leon Haslam, still feeling the pain from his crash at Imola, had a technical problem in FP1 that hindered his work. So in FP2 the tough English rider gave it his all to make up for lost time, making some substantial changes to the setup on his RSV4 RF and finishing the combined standings in eighth place. In light of the events of the day, this is an encouraging position for Leon and his team. There will basically be two goals tomorrow: getting in as many laps as possible in order to analyse the Aprilia’s performance over race distance, and continuing treatments in the Mobile Clinic to keep the pain to his ribs under control. This is to ensure that he is in the best possible conditions for the races on Sunday. Rookie Jordi Torres had to deal with one of the nicest but just as demanding tracks on the calendar. 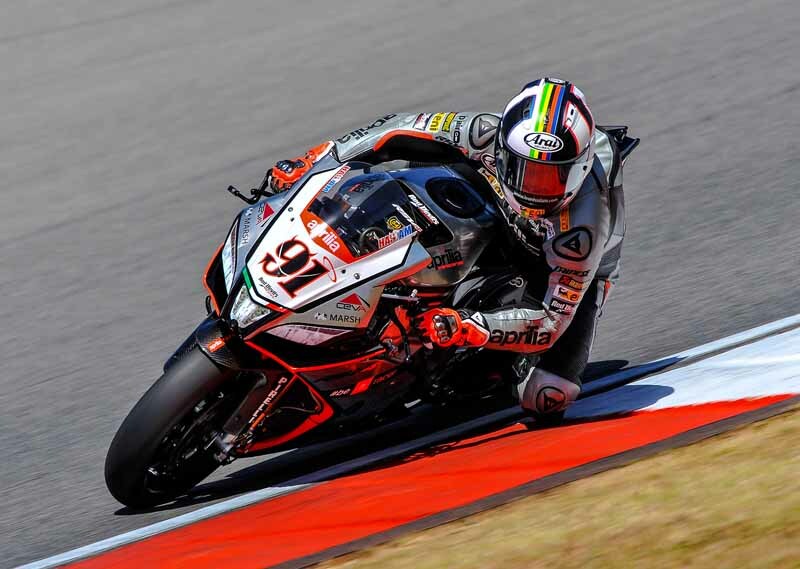 Portimão, where Jordi only had the chance to lap for one afternoon in the pre-season tests, has a lot of blind turns that demand maximum confidence from the rider. Today went well, with a final ninth place, so Torres and the team will be able to work in peace of mind, preparing for another step forward tomorrow. Two things are an indicator of this: the improvement of about 5 tenths of a second between the two sessions and the “ideal time” (calculated from the best sectors) which is 317 thousandths below the best performance the Spaniard put in. Jordi Torres: “Despite having taken a few laps here during the tests, this is a difficult track to learn if you really want to go fast. There are a lot of turns without any visibility and you need to know them well to tackle them the right way. We are improving. We still can’t get the RSV4 to perform well on the tightest turns so we need to do some more work on the setup. I’m pleased to be in the top 10. It is a good position for me, but now I need to gain confidence because in this championship nobody lets up on the gas!”.